Saint Patrick is one of the most famous saints in the world and this assembly is designed to entertain and educate audiences and performers alike about his life. The play is highly amusing and yet respectful to the subject matter. The play contains some fun Irish expressions, dancing sheep and some rather inept pirates. 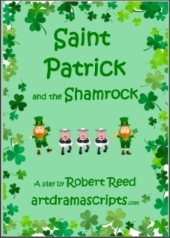 Contemporary comedy about Saint Patrick - the patron saint of Ireland. More at St. PATRICK'S PLAY. Suitable as classroom play or school assembly play for St Patrick's Day. A little Scottish boy's mum and granddad decide he must go to the library to learn about Scottish history. Read more about the plays or buy the play scripts individually. about the life of St. David. and humorous scenes in the play. The script provides an ideal resource to celebrate St. David's Day. The play contains some Welsh words and phrases (the script includes a guide to pronunciation). An angel guides Saint David where to build his monastery. The local Celtic chieftains believe St. David is going to take over their land and they set off to sort out the monks. However, the chieftains are quickly punished and hastily retreat and apologise. Angels save one of St. David's monks, Aidan, and his "important book". Later, Saint David goes on a pilgrimage to Jerusalem and on his return there is a gathering to select the Archbishop of Wales. The crowd has no trouble in seeing and hearing St. David. Is it because of the help of a friendly dragon or is it a mountain growing under him? Funny play script for kids. The story of Saint George and the Dragon has captured the imagination of children for centuries. Everyone knows the story of how the brave Saint George defeated the dragon, so it's fun to change the plot with a magic lamp and confused genie. Read more about Saint George, the Dragon and the Lamp play. The play incorporates traditional elements of the story of Saint George with some novel creative ideas. This is a humorous and fast-moving story of a chivalrous knight and his talking camel squire on a quest to protect the weak from evildoers. Cornwall is a land rich in myths and legends with its own cultural identity and language. This funny play has be written for primary school assemblies to educate and entertain the audiences and the children performing the play.